Time for a Wee bit of stitching. Wee Care stitching. I had used these two gowns in progress for a Wee Care Construction program for my local SAGA chapter. It only took a Wee bit of time to finish them up when I brought them home. They have been finished for quite some time, just waiting to have their picture taken! It is quite cloudy here today so I feel like the photos are a bit dark. That aside, you can still see their sweetness. I love Wee Care. Both gowns are made from Imperial Batiste. 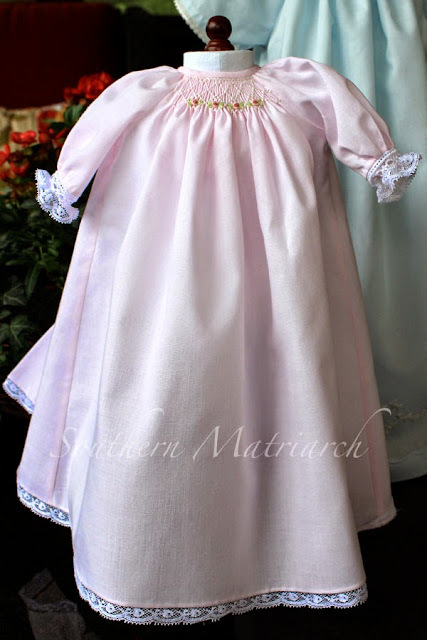 This sweet little pink gown is made using Gingersnaps Baby Daygowns Book IV. Available through Gingersnaps directly or most heirloom shops. It is smocked with a very simple design with a few pink rosebuds added for extra sweetness. This is the smallest preemie size. I did add a smidge, like 1/2 inch, to the center front to get a few extra pleats on this tiny size. An extra teeny rosebud at the back closure. And the camera never lies, didn't realize that I had a stitch showing from sewing on the snap. Isn't that rosebud the sweetest thing? Ignore the errant stitch. 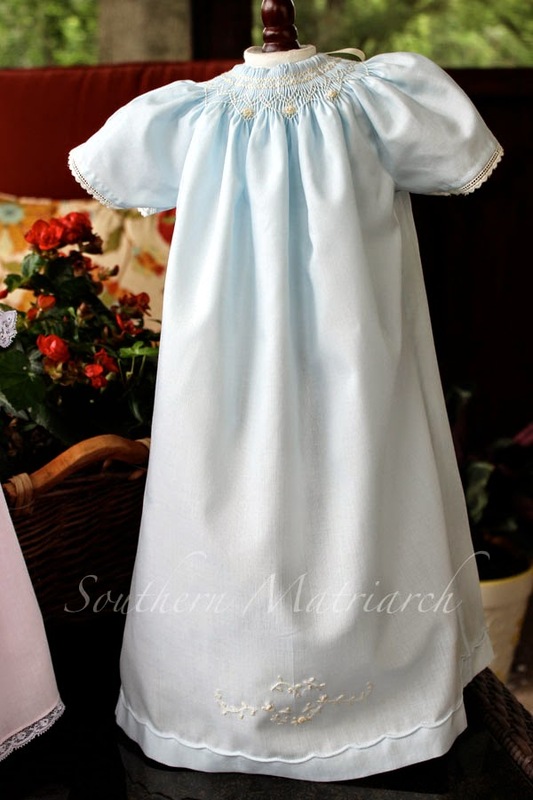 The blue gown is made using the "Grady Gown" pattern from the Atlanta SAGA chapter. It is a modified bishop type gown. It is a 3-5# size. Ignore its listing to the side, the stand is sitting on an upturned cereal bowl, the gown was longer than my dress stand. 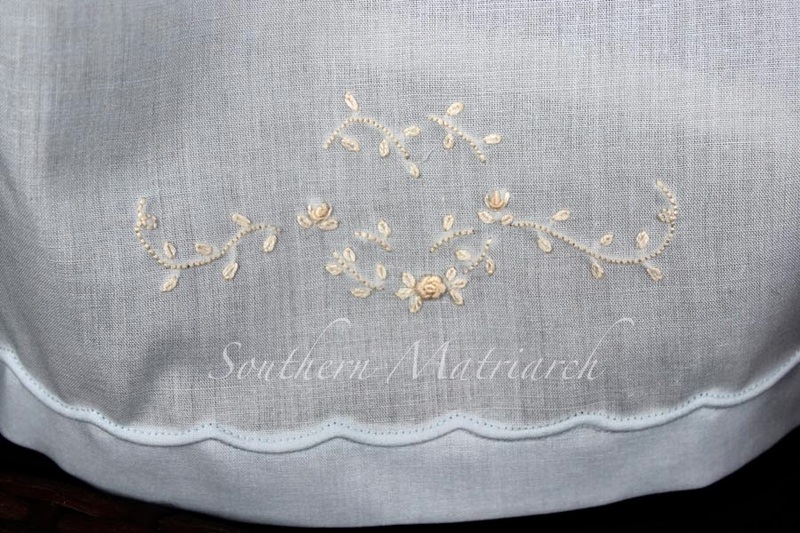 The hem is embellised with a twin needle tuck using the scallop stitch on my machine. I can take no credit for this idea. 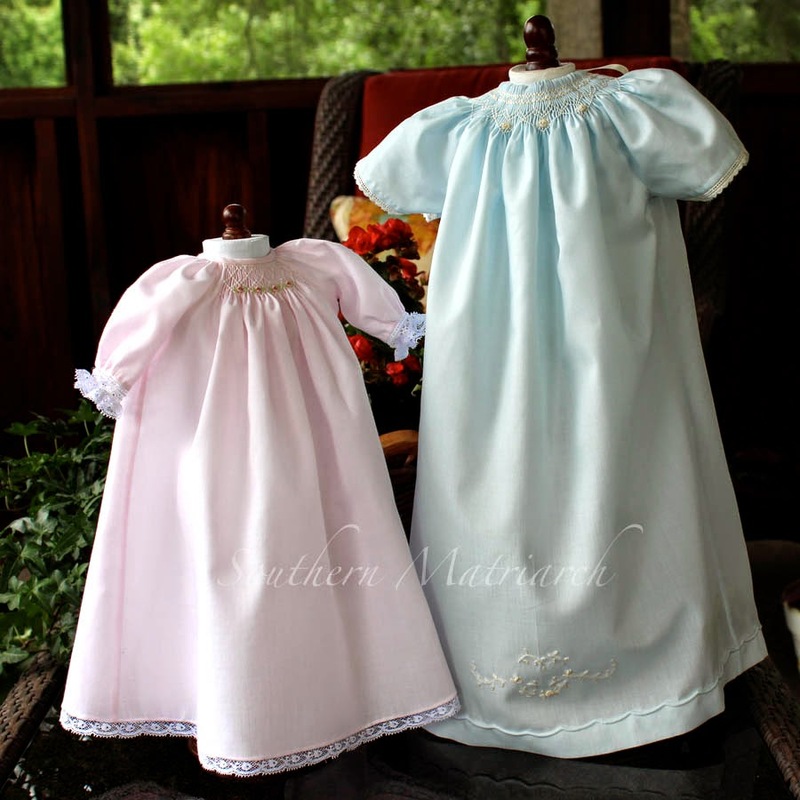 Last year the Greater New Orleans SAGA chapter brought some Wee Care gowns to convention with this hem treatment. I think it is so sweet. The skirt embroidery is a small design from Jeannie B's Book of Heirloom Embroidery. I like blue and ecru together. Not a big fan of pink and ecru, but I love blue and ecru together, so that is what I used. 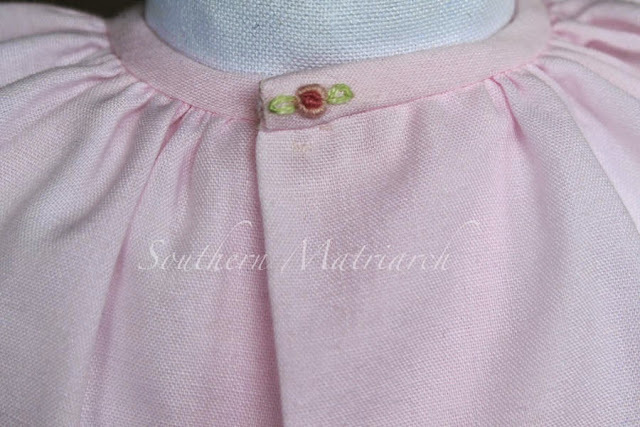 Again a very simple geometric smocking with a few rosebuds. 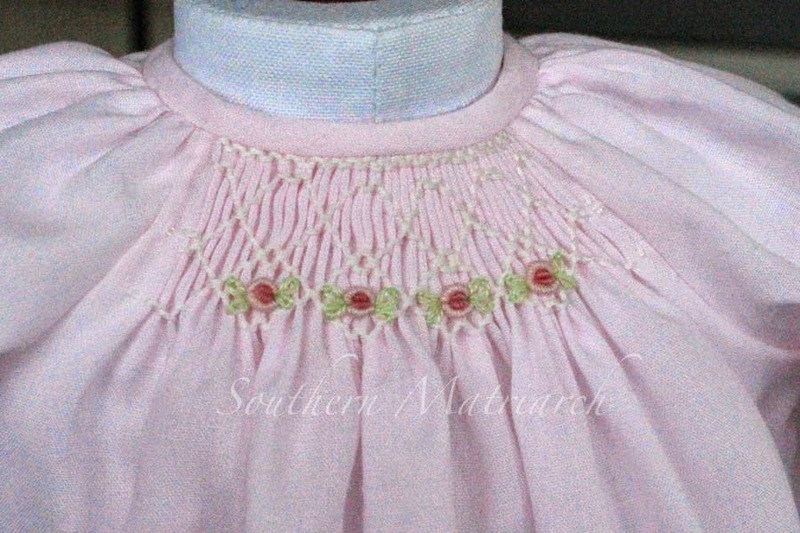 You can see the modified bishop neckline that is achieved with a casing at the top to run ribbon through. 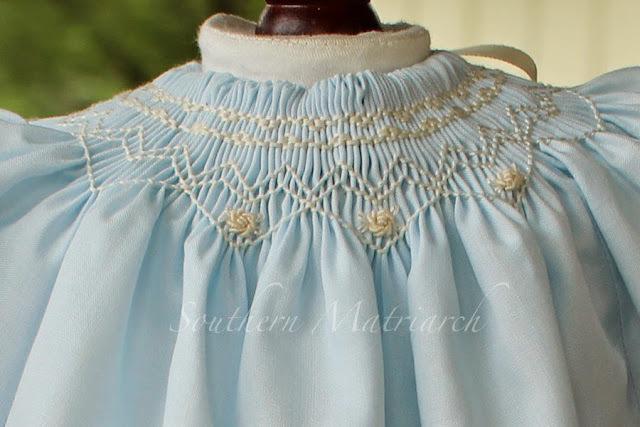 This makes for a very adjustable neckline often needed for the tiny babies. The sleeves on a Grady gown have a tendency to be quite full, just a stitched an inverted pleat and stitched a tiny rose at the join. there you will find the rules, entry form and where to send them. Until next time, back to cherry dresses for now faithful readers. Love your addition to the Grady sleeve. So beautiful! 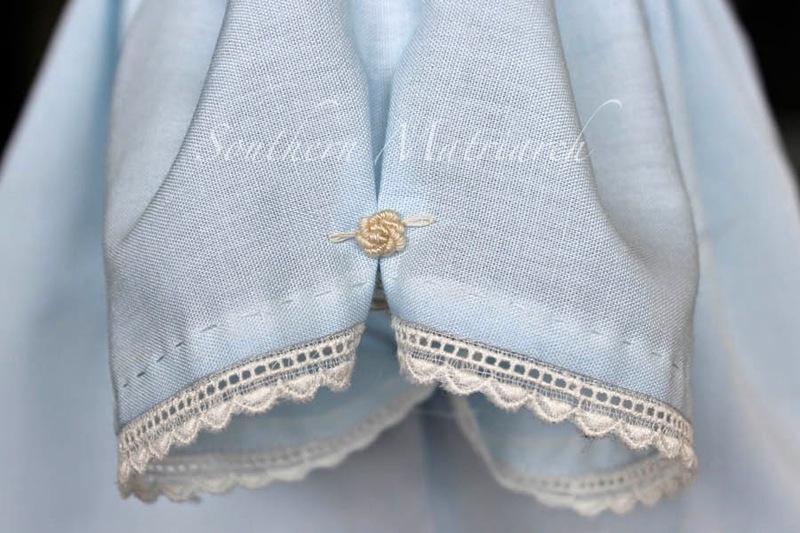 Love both gowns and the ecru/blue combo. I have not tried the adjustable neck of the Grady gown. That sweet rosebud at the back of the pink dress is the perfect touch. The scalloped hem treatment is also new to me. Thank you for the reply to my recent comment on backsmocking. I will need to reread the article you mentioned.